Sometimes an easy card is just the speed I need when I have a card to send out. There's all kinds of ways that you can put an easy card together. One of the ways is to use patterned paper as your backdrop. As you can see from this card, the only stamping that I did was the quick greeting at the bottom right corner of the card. I used Whisper White cardstock as my base and then layered a piece of patterned paper from the Welcome Neighbor pack of paper from the Sale-a-bration catalog. The greeting comes from the Three Little Words set, which also is a freebie during Sale-a-bration, and was stamped with Basic Black ink. To dress up my card a bit, I used the Beautiful Wings Embosslits die that is only available through the end of April in the Occasions Mini Catalog. I like to use this die for my cardstock scraps. I run a bunch of them through my Big Shot with this die and then put them into a plastic baggie to keep on hand for when I need a quick embellishment to use on a card, scrapbook page or gift project. 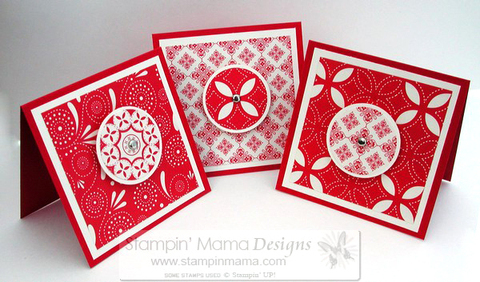 I like to pop some of them up with Stampin' Dimensionals (aka: pop-dots) and then put others directly onto the card so that there's some dimension and it looks like some are closer and some are farther away. 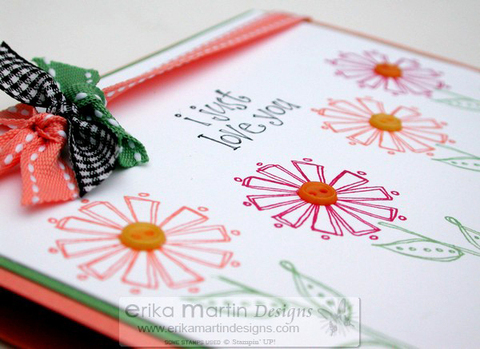 I used Regal Rose cardstock and a little scrap of Marigold Morning (which I'm still so sad that it retired). A length of So Saffron grosgrain ribbon ted with a double knot finished off my card. One of the biggest reasons I hear for people not using their paper crafting supplies, or even *GASP* not getting into paper crafting in the first place, is that they don't have the time for it. Or that they don't have a ton of stuff to use to make a great card. A card like this one took very minimal supplies and it also took very minimal time to put together and it's FUN! This card literally only took me about 5 minutes to put together! It just goes to show that you don't always have to have a big chunk of time set aside to make a beautiful card. I love to look through stamping and scrapbooking magazines but I find it very rare that I ever CASE anything (Copy and Share Everything). In fact, I don't even open up those magazines if I'm looking for ideas. I find that it actually stunts my creativity when I'm in the midst of creating a project. It's just my twisted way of working (or should I call it "playing" since it never feels like working to me). I picked up our big pile of mail at the post office yesterday (I love coming home to a BIG pile of mail after a weekend away) and I had THREE new magazines in my pile. I almost don't know what to do with myself when that happens. I never know which one to start looking at first. I usually just end up looking at each one just a little bit and then going back and forth between them all. In the newest issue of PaperCrafts is an article on monochromatic cards. I ADORE monochromatic ANYTHING! Especially cards and scrapbook pages. 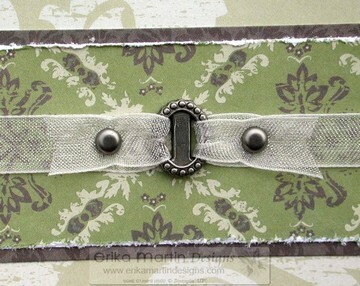 There was an adorable monochromatic card in shades of green by Lisa Nichols. The card used little squares of Stampin' Up's Prints Designer Series paper and I fell in love with it. I HAD to CASE it.....well, not entirely CASE it. I loved the concept so I created something with the same concept in mind. Lisa's card used 9 squares. I revamped the design a little and used only 4 squares. I also put my greeting in the center of the card and used a rectangular design instead of a circular design in the lower right corner. This card literally only took me about 7 minutes to create. It's a very easy card to make. I started off with a Bashful Blue card base. I cut the cardstock at 4 1/4 x 8 1/2 inches. This created a cute square sized card. The Whisper White cardstock layer measured at 4 x 4 inches. I used pieces of Bashful Blue Prints Designer Series paper from the Prints Pack Level 1 Hostess gift. The Prints Designer Series paper that SU offers (not just in the hostess gift, but also in their catalog in the big 12 x 12 papers) work perfectly for monochromatic projects. I can never get enough of these papers in all of those delicious colors they have to offer up. I cut the little squares at 1 3/4 x 1 3/4 inches each. I copied Lisa's lead and used my Bashful Blue Stampin' Write marker to create little stitch lines in the white space between the squares. 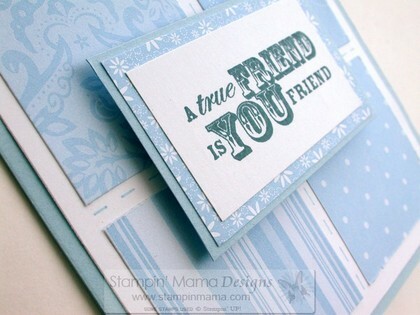 I stamped the greeting from the True Friend set (Stampin' UP) on a piece of Whisper White cardstock with Blue Bayou ink. I mounted it on top of a piece of Bashful Blue patterned paper and then again on a piece of Bashful Blue cardstock. I mounted this on top of my card with some pop-dots for some subtle dimension. Now I can't wait to try out a whole set using other colors of the Prints papers. I don't know what in the world took me so long to order this paper but ever since it arrived, I've been wanting to use it all up! I ordered the paper for the cute Recipe box kits that I recently offered and I LOVE using it for cards. What I love about Stampin' UP's Designer Series paper packs is that you can use them almost by themselves to make a card! If you're looking to make a quick card and don't want to have to pull out a ton of stamps, SU's Designer Series paper packs are the way to go! And it's really easy to use up smaller pieces and scraps that you just can't bear to throw away. Have you seen all the paper stacks in your craft and scrapbook stores that have the glittered accents on the pages? I really like that look but I'm usually hesitant to spend $20+ for a big pack of paper when I have so much at home already that needs to be used up. So......to create the look of patterned paper with glittered accents, all I did was break out my 2-Way Glue pen and my Dazzling Diamonds glitter (both from Stampin' UP) and quickly created my own glittered paper. For this card, I used the designs to guide where I wanted to apply my glitter. I quickly drew my glue pen over the dots on the thin strip of patterned paper and sprinkled glitter over it. I did the same on the flower that I punched out from the Summer Picnic paper. I drew around the outline of the flower with the glue pen and then applied the glitter. 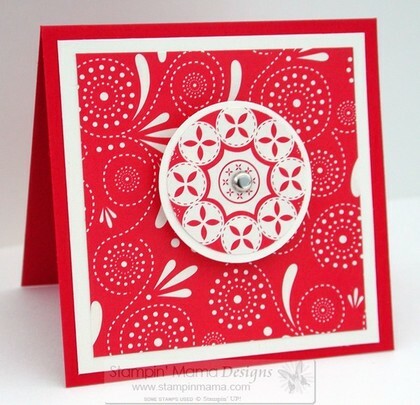 I mounted the flower on top of a scalloped circle (Certainly Celery), which was then mounted to my card with a pop-dot for a little extra dimension. 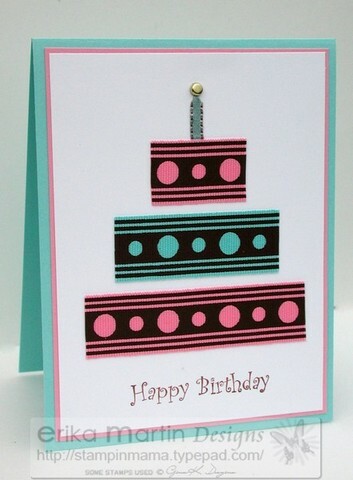 The only stamp that I used for this card was the "happy birthday" image, which comes from the Eat Cake stamp set and was stamped with Basic Black ink. 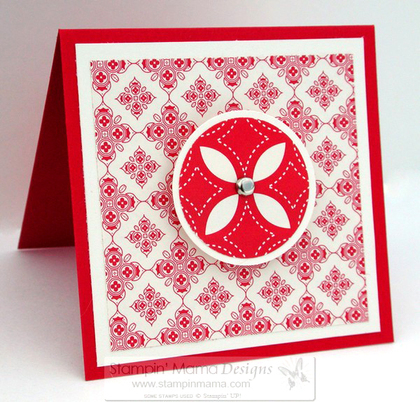 This card literally only took me about 7 minutes from start to finish, even with cutting out the red patterned paper circle, which I cut with my Coluzzle circle template. You could step this card up if you wanted to and add a few brads in the upper right corner of the card, or tie a ribbon around the end of the dotted strip. These three cards were offered up on my Groovy Give-Away last Friday, but I wanted to do a separate post to explain a little bit more about these cards and show some detail. These three little cards are only 3 x 3 inches, but they pack a lot of punch. I wanted to create a set of cards that were quick to make and also contained no stamping (*gasp*....yes, that's right, I said it.....NO STAMPING....you can all start breathing again now). It's amazing what you can do when you force yourself to put the stamps down and look around your craft space to see what else you can use create. In this case, I went to the patterned paper and punches. My little 3 x 3 finished card bases are created with Real Red cardstock. 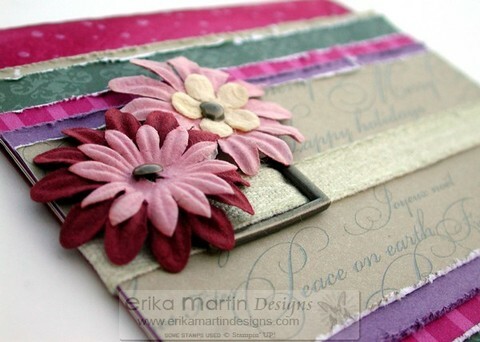 I am SO glad that I tried out the Cerise Designer Series paper before it becomes permanently retired. I really liked the Au Chocolate paper that Stampin' Up offered last winter and was kind of leery of getting the same kind of patterns in bright red. I held of and finally went for it last month and finally broke the package open last week. Wow, am I glad I did! When the new catalog arrives, I'm really hoping that there are some new colors in these patterns because it's great to work with in making non-stamped cards. These little cards were as simple as cutting some cardstock and paper and using some quick punches. Nothing fancy, but the results are clean, simple and very eye catching. I found that by playing around with positioning my circle punch (I used the 1 1/4 inch circle punch for the smaller circles) over the patterned paper that I could get some really cool punched looks. This card here uses the same paper for the punch out that I used as the background in the card on the far right in the first photo. 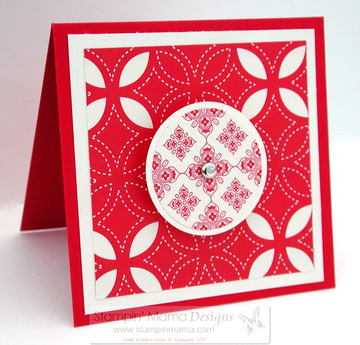 The larger circle was punched out of Very Vanilla cardstock, as it matches the Very Vanilla in the patterned paper. I punched that out with a 1 3/8 inch circle punch. I adhered the two circles together and then used my 1/16 inch circle punch in the center of the punch out so that I could put a small silver brad through the hole. This card here uses the same papers as used in the card above, but I reversed them. 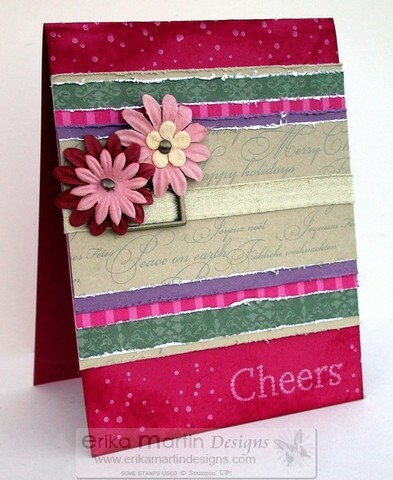 The punched paper from above got used as the background in this card here. The background from above was punched out for this card here. The cards use the same patterns, but they have a totally different look. And again.....no stamping required! This is one of the cards that I designed for my Stamp-a-Stack that happened last weekend (and for the "Holiday Stamp-a-Stack by Mail"). I had 4 designs and everyone did 5 each of those designs. The other 3 designs were done with colored cardstock as the base. I wanted to do one design that used vanilla cardstock as the base, as I find it really personifies simplicity and elegance. I wanted to create a design that didn't take away from the simplicity and still retained a classic elegance. This is what I came up with. Very simple, but very elegant. It's truly simplicity personified. But it's also elegance personified. 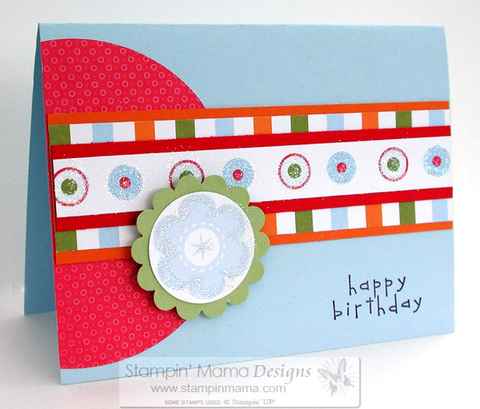 A little bit of patterned paper can go a long way......just a quick strip across the center of the card adds a little bit of contrast and color. Again....very simple, but striking. It's hard to tell from the photo but the snowflake shines and sparkles with, yup, you guessed it....Dazzling Diamonds Glitter. That glitter works on so many levels. It can be used to make a bright balloon on a child's card come to life....but it can also turn a simple snowflake into a sparkling wonder. Speaking of sparkling wonders.....I recently updated my son's blog with a post and pictures from the trip we took last month to Florida. I keep meaning to share it with all of you and I keep forgetting. If you'd like to check it out, you can click here: Zach's World That little boy of mine (though he's getting to be not-so-little these days.....hard to believe he's almost 9 years old soon!) always keeps us guessing, but he's always full of sparkle and wonder. I just can't help myself when it comes to layering with these Designer Series papers. They lend themselves so well to it. Yes, that is direct-to-paper you see around the outside edges of the Purely Pomegranate cardstock that I used for the card base. And yup, you guessed it. I couldn't keep my hands off that little distressing tool from the Cutter Kit. Sometimes I wonder if that thing will outlast me or if I'll outlast IT! I have used that little tool SO hard but it never seems to give up and give in. It just keeps going. Someone just recently told me that it should outlast me since it has 7 blades on it, but I've given every one of those blades a work out. That little tool AMAZES me. Not just with what it can do, but that it has held up to the constant beating I've given it. I LOVE that thing! 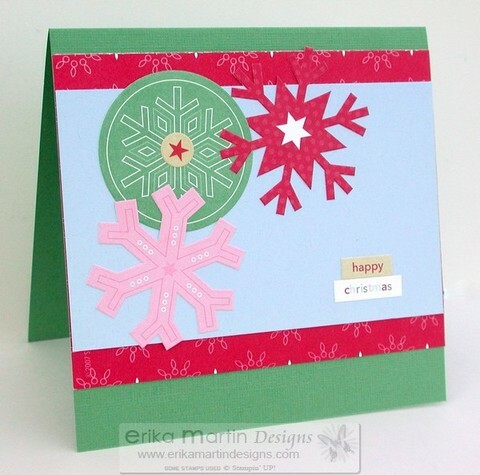 I used the Snowflake Spot set for this card.....not a whole lot of stamping, but just enough. 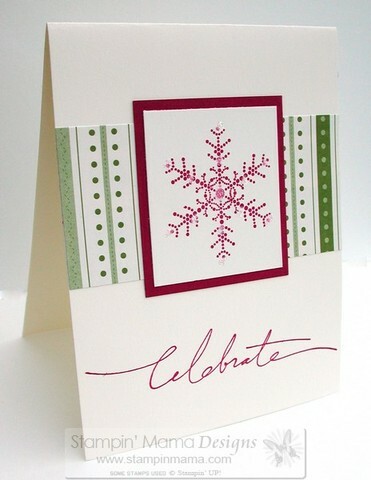 I used Whisper White craft ink for the snowflake spots across the top and bottom of the card and also for the word, "Cheers." If you look closely at the Twill Tape that I used on this card, you can see that it's not the clean ivory color that you see when you open the package. When I laid it on the card, it looked TOO clean. I swiped my River Rock ink pad across it a couple times to make it look a little dirtier and match the River Rock colored patterned paper underneath. I really like how it came out. I used a ribbon buckle from the Antique Brass HodgePodge Hardware Kit to thread the twill tape through and then embellished over the top with a few prima flowers and Antique Brass mini brads (also from the HodgePodge kit). Oooooh, I just thought of a really sweet 3-D project I could make with this pretty paper.....but I'll save that for another day and another post. Maybe even tomorrow! 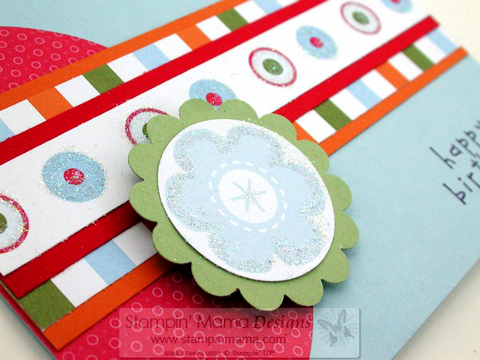 Another quick Simply Scrappin' Kit card....and a challenge to you! Yes, I'm still working on that Winter Bright Simply Scrappin' Kit. It's amazing how much stuff comes in that package! It's like a Never Ending Gobstopper! It just keeps going and going and going. It's extremely easy to slice a few pieces of cardstock, some paper and pop some stickers to it all. Imagine how quickly you could put together your holiday cards this way. I have used my kit for SO much and I still have plenty to use. Of course, I also have lots of stickers because I'm a hoarder. Well, now there's a challenge for me. 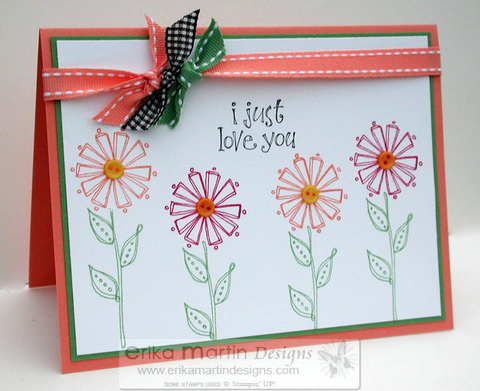 I'm going to create a card using JUST a cardstock base and stickers. No cardstock layers, no patterned paper....just stickers. I double dog dare you to do the same! :) Let's see what you can come up with! 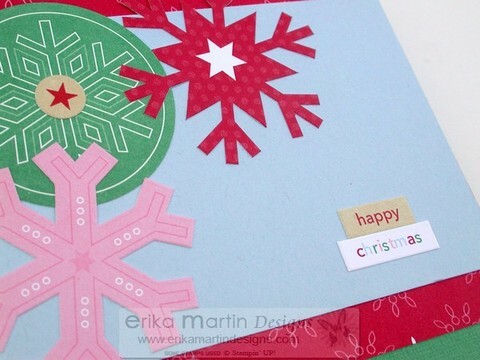 Send me a picture of your card made with just Simply Scrappin' Kit stickers! I'd love to see what your creativity cooks up! While using the buttons on yesterday's post, I wanted to try something with buttons again. Who knew those little buttons could be so addictive? I used the Double Line Doodles set for this card. Just a little bit of good old fashioned stamping for this one. I've been challenging myself more and more to use the new In Color color palette and really like the way this turned out. Of course, I happened to have some of the new and beautiful Double Stitched Grosgrain ribbons in the In Color colors so that helped to tie it all together really nicely. The stems are in Wild Wasabi and the flowers are in Purely Pomegranate and Groovy Guava (I LOVE that name). I used some mini glue dots to adhere the little buttons to the center of the flowers. Aren't they SO cute? I love doing these little flowers at different heights. It gives a little more visual interest. 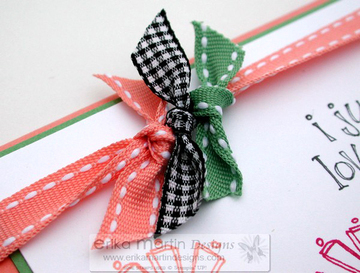 I tied a length of Groovy Guava ribbon around the front of the card and secured it with a double knot. That just didn't seem to be enough color and contrast for me, so I added a couple more colors. I added the Wild Wasabi double stitched ribbon in a single knot around the Groovy Guava ribbon. That just didn't seem like enough to me, either. The black gingham ribbon was the finishing touch for me.....especially because it coordinated with the greeting that I did in Basic Black ink. Again, I did a single knot with the ribbon, the trimmed the edges of the ribbons. Perfect! Today is the day we come back home....as you're reading this, we're back in the air and our vacation has come to an end. I hope you've all had a wonderful weekend....and a great start to the new week! I may not have the specific stamp sets to coordinate with this paper, but I'm finding all kinds of ways to use it even WITHOUT the stamp sets. Who said you have to own everything in order to make a beautiful card? Of course, that doesn't stop me from DREAMING about owning everything.....a girl HAS to have dreams, right? Since I don't have any of the coordinating stamp sets to go with the Brocade Background Designer Series paper (which also happens to be double-sided), I decided to use the paper as my main focus. Even though the patterns go this way and that....stripes, flourishes, diamonds, etc.....they still look really nice together when layered. I used the distressing tool on my Cutter Kit to rough up the edges of the paper a bit, to give it more of that shabby chic feel. I used a pewter ribbon charm with some narrow ivory organdy ribbon as an embellishment and secured the ends of the ribbon back with some pewter finish mini brads. I trimmed the ends of the ribbons into a "V" shape. I swiped around the outside of the card with my River Rock ink pad. The more I use this colors, especially for swiping, the more I see the benefit of this peculiar color. I wasn't quite sure what to do with it when I first got it, but it's a close second for swiping behind my Creamy Caramel pad. I used the "thanks" image from the Much Appreciated set with Always Artichoke ink to finish the card off. 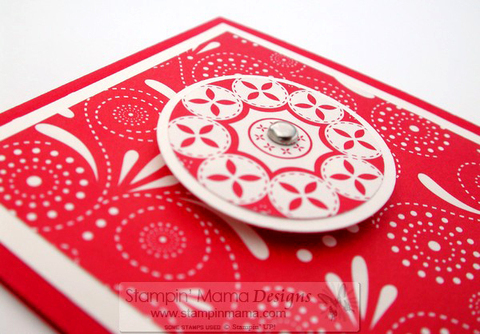 Another quick card with a little bit of stamping and lots of wow! 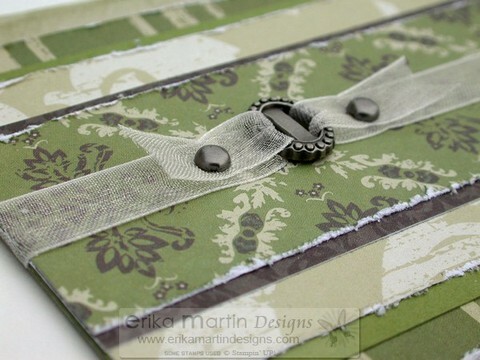 I have been having so much fun trying out new uses for ribbon, paper strips, border stickers, etc. I've been looking for ways to use the things I've hoarded over the years, as well. 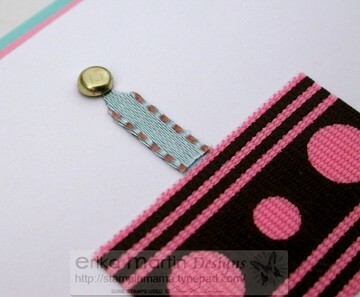 Not that long ago, I stumbled on some really great ribbon with chocolate brown, pink and aqua. I never really considered myself a fan of the color pink, but the more I see it paired with chocolate brown, the more I've fallen in love with it. And how can you go wrong when chocolate brown is paired with aqua? It's just so yummy! When I shared my cake card last week, my friend, Jen, had some fun with her Photoshop program to give me some new ideas and inspiration. She used just a couple of colors for the cake and ribbon and that got me to thinking. Thinking that it was high time that I broke into this ribbon that I've been hoarding for about 4 months (actually, 4 months isn't that bad, considering how long I've hoarded some of the other stuff in my collection). And yes, that's my coveted Cool Caribbean cardstock again. I told you I was getting a little more liberal with it. I lifted my rationing orders on myself to make this card and yesterday's card. It was just too perfect to pair with that aqua/chocolate brown ribbon. For this card, I simply cut lengths of ribbon and adhered them to my cardstock with SNAIL Adhesive. It's amazing how well that stuff sticks ribbon down. It's not coming up any time soon.....or EVER for that matter. I really just eyeballed the length of the ribbon and played around with it according to the dimensions of the cardstock. 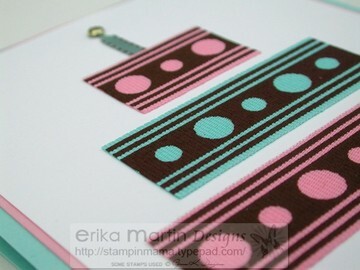 I used GinaK Designs's Curly Happy Birthday stamp for the greeting at the bottom of the card using Basic Brown ink. This card literally took me under 8 minutes to put together. Talk about easy and quick!